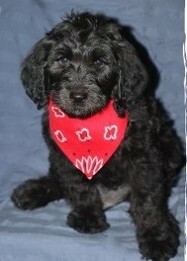 Our daughter is looking for a puppy and she would love to get a mini labradoodle. She loves Kailani and would love to have a mini version of her! 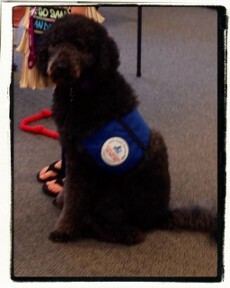 We have been doing a lot of training with Kailani. She easily passed her Canine Good Citizen and has gone on to agility training. She is great at this and loves it. She is sooooo smart! Such a fun dog. She loves everyone! We take her to visit our parents at their assisted living complexes and she is so wonderful with the older people. So sweet. 5 years! Can't hardly believe it. Ava and I still spend 22 hours a day with each other..a couple hours in the mountains, on the ocean beach, or on the waterfront, etc. every day. We drove over 6 thousand miles together (Boston and back) this year and she was the most perfect travel companion imaginable. As usual, absolutely no health issues to be aware of whatsoever this year; perfectly healthy, she has gained only one and a half pounds over the last three. In short, like Mary Poppins, Ava is practically perfect in every way. For years, everyone has been totally blown away by her personality, intelligence, her tricks and routines…... 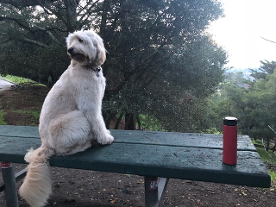 I think if I put my hat down at Lake Merritt Park when she’s doing her tricks and we’re just playing, we could make a little pocket money. My daughter and son and law live with us in this big beautiful house and they just had a baby boy; with everyone over visiting to greet him, Ava’s overt and shameless jealousy in combination with her intellegence has been on full display and totally hilarious. Is my experience typical for the pups in her litter? I’m wondering? 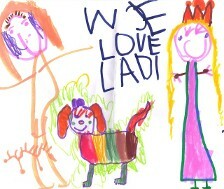 As a child, our family always had dog(s). My eight brothers and sisters and I have always had a dog. I’m in my sixties. I could probably name fifty of our family dogs off the top of my head (we’re close and we always brought our dogs!) but none of these dogs was anything like this beautiful creature. Truly remarkable. She has definitely made the world a better place. 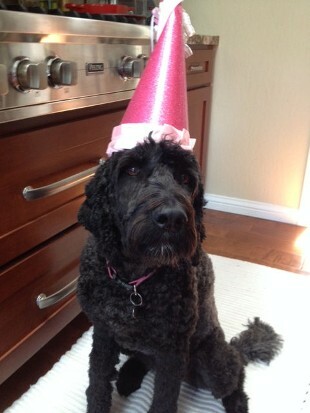 Sydney’s first year has flown by. She’s such a good little girl, the perfect addition to our family. 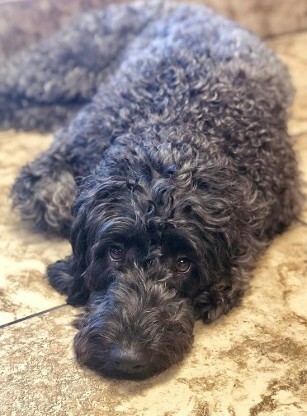 She’s a great little traveler, quite the snuggler, did great in her obedience classes,... We are now 2 for 2 on getting great doodles! 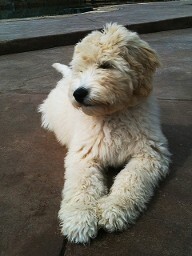 You are so right about labradoodle puppies. Murphy has settled into our family very nicely. He is so fun, cute, smart and adorable. He learned his name within several days, housebreaking was not an issue, he sits before meals and waits for the ok command. 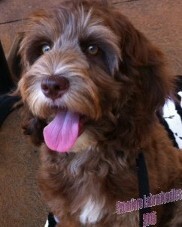 He is enrolled in a puppy socialization class; having great fun. Scarlett his 10 month old older sister has shown him all the cool spots in the yard and they have become best buds. 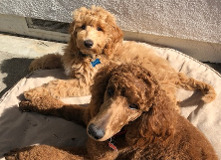 Scarlett accepted Murphy from day one and Murphy has taught Scarlett how to shake! 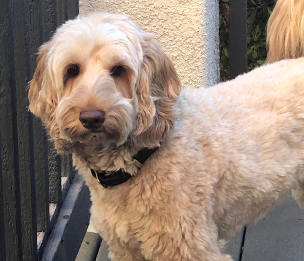 Kelly and I just want to say the whole experience in bringing Murphy into our home and family has been so exciting, pleasant and very professional. 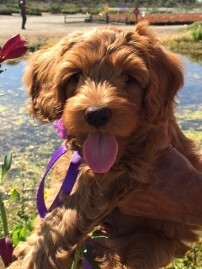 Premiere Labradoodles’ website is informative and constantly being updated, selection process was professional and complete, viewing the puppies before hand and the pickup and take home “seminar” was so valuable, the photos and all the followup information and finally explaining the importance of the ALAA. Wow! 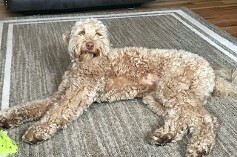 Thank you for taking a passion and turning it into a business so others may enjoy, with complete confidence, labradoodles as family members. Finn is doing great. He is headstrong, as you predicted, but we all love him to pieces. He is such a smart dog. 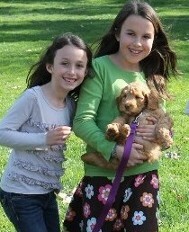 One scary but amazing story is that my daughter and Finn were outside last summer walking in our back yard. Emery heard a loud buzzing and turned to find a rattlesnake coiled and having a stare down at Finn. Emery kept calling him and he moved to be positioned between her and the snake. She finally had to go grab him and they both ran in the house. Brave dog that he is, he was standing looking at us like nothing happened, and we realized he wasnt putting weight on his back foot. We had him at the vet in 10 minutes, and he was given the anti-venom. He is such a strong dog, and improved over night. We were so lucky!! Ted is fabulous! She loves to play with balls, loves the snow, her favorite is disc golfing. We have a course by our cabin. She knows where each hole is and runs to it. Then we throw the discs and she runs to them and turns them over. It’s hilarious!! 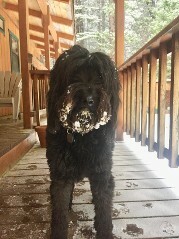 We’re in the Sierras near Bear Valley and just walked in the door from a walk with Cosmo. He is doing great - can’t believe it’s been 5 years! 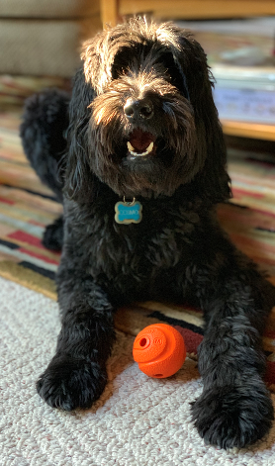 He has been a wonderful member of the family - our son thinks he needs a sibling :-) He loves Maggie (Abby’s dog from you) and when we’re at the cabin constantly checks to see if she is next door. Wherever we go, he is the center of attention - not only is he handsome but he has a calm personality and loves people. Sometimes friends who are feeling down borrow him as a kind of therapy dog. This speaks volumes to his personality. Thanks for bringing Cosmo into our life. Cosmo is one in a million! Peach is ABSOLUTELY AMAZING!!!! 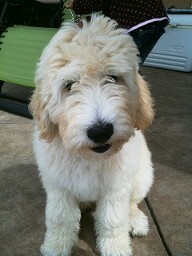 She is the perfect dog! She is so incredibly smart too! She actually does scavenger hunts for our boys. She gets their snacks out of the pantry and hides them around the house for the boys. She then watches them find the snacks and gets so excited! It took us a couple times to realize what she was doing and now it’s one of her favorite games. She doesn’t even try eating the snacks! Her coat is so soft and shiny. It had kept its curl. She is incredibly sweet and loves having along us together. She has a strong pack instinct. Frankie is doing well. We are living in Namibia now so Frankie is quite the jetsetter. Here is a recent photo of him on one of our evening walks where he can be off leash and enjoy dashing through the long grass. We had another baby last month and Frankie is adjusting very well. Frankie is incredibly sweet and handsome and absolutely wonderful with people of all ages. And while he still has lots of energy he is very well behaved. We feel very lucky to have him as part of our family. Here’s a photo of Yomi with his first big boy haircut. He continues to be a delight and we don’t know how we ever got along without him. Cole is an excellent animal. He is right at 30 lbs as of a week ago. He has so much ’common sense’ It’s like he knows what to chew and what not to chew, he relaxes when we are relaxing, he doesn’t whine, scratch at his crate to get out or anything. If he is awake before me in the morning he doesn’t make a peep, but lays there patiently. He is naturally well-mannered and getting better. I take him to the office every day with me and he is great in the elevator, around strangers, noises, etc. He is comfortable with me touching is body all over, pulling off burs, etc. He is good at brushing and baths. He loves attacking the water when I am spraying the yard. It’s pretty funny how he chases it and bites at it. I have been training him and we have not gone to puppy kindergarten. He knows sit, come, stay, lay down, bed, down, off, drop it, crate, out, pen, inside, up (to get into the car), he sits and waits for his food, walks really well on leash and he pretty much goes potty on command. 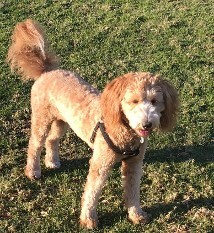 His off-leash recall is getting better every day, but he is very good at staying in the yard and close at the park. I just have to tell you that we love Izzy so much. She is the heart of our family bringing us all together after my husband, my childrens’s dad, passed away. She is the most amazing people we have…...love, love, love her! We love Chanel and have become so attached to each other. She follows me around, knows my walk and looks for me as soon as I wake up. She's cried when I've been in pain and/or going through hard times. John could not believe it when he heard her cry, it was so sweet and unbelievably heartbreaking. She fills our lives and keeps us on our toes, we love her so much John spoils her rotten, and she loves to go for rides. As soon as the car door is open, she'll hop on and is ready to go. Just wanted to send you an updated picture of Luigi. Now I can't even remember the name that he once was. Anyway he is a wonderful dog and we absolutely love him. He is fun active playful and very very friendly. He loves hanging out with other dogs, but I don't think we're going to get another one right now. Cats will have to do. Hope all is well. 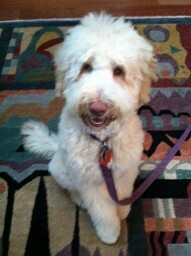 Darby has completed a 6 week course of Puppy Kindergarten. He graduated and has been doing well on these tasks. He is now enrolled in a 6 week course called Brilliant Buddy. He is the youngest in the class where the others are 9-11 months old. He does well even with these older pups. He loves his crate, is pretty much potty trained, enjoys his cat Arnold where they play constantly, and is a super lovable dog. 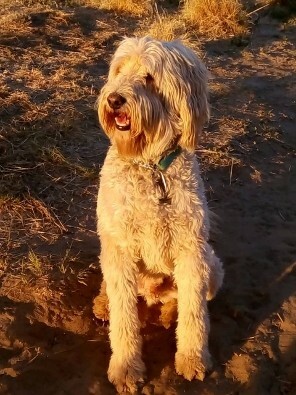 We have taken him a number of times on the boat (loves it…sleeps most of the time), hiking, camping a few times, up to Idaho to see the eclipse, has been with lots of other dogs and people and does will in all situations. In the yard he stays with me on a cable and is curious about everything. He gets daily walks and lots and lots of attention. I wanted to give you an update on Luna. She's still the sweetest puppy and we are completely smitten with her. We've started leaving her alone uncrated for stints of time (we've done up to 4.5 hours on a couple occasions) and she's been totally perfect (no accidents or destructive behavior) - we've only done it on days when she's pretty tired though (however, she has never been destructive at all with the exception of one sandal when we first got her). We still crate at night and occasionally during the day, but she's mostly with us (unless she's at daycare - usually two times a week). She's very calm, but seems to have a lot of energy for exercise and socializing - if there is something going on she wants to be in the mix. She is so great with kids! So engaged and intuitively calm and gentle. Hopefully she'll be great for baby (who arrives in about 2 months). Hoku is doing great! He gets along well with all people and dogs; nothing seems to throw him off. 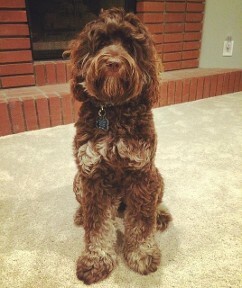 He is such a love, and he looks like a teddy bear. 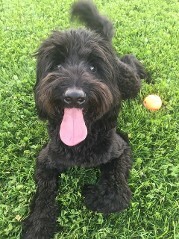 He knows his commands well and even runs to me when he is in the middle of playing at the dog park (I like to work on recall in high distraction environments just in case). He really is a terrific dog! Hera continues to be a lively sweetheart. She adores any opportunity to play ball and will call attention to where the ball is stored to try to get some participation from us. When the ball is out, nothing exists for her outside that magic sphere! We are often stopped on our walks to ask what kind of dog she is and to admire her. With her unusual coloring, she is mistaken for all kinds of breeds. 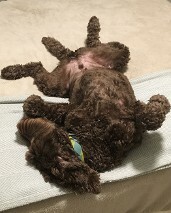 She and her brother, Hercules the toy poodle, generally give each other distance unless they want to play or Hera attempts to draw the old man, age 9, into her world. Any opportunity I have to tell where we adopted Hera, I am delighted to share. We have had no further issues with her wandering off, thank goodness! I know that it was even more traumatic for her than it was for us. I will never be able to thank you enough for your concern and help at that time. 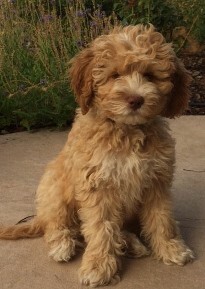 My wife and I are madly in love with Taffy and she has brought much happiness to our home. You created a fantastic puppy when you bred Taffy. She is the joy of our lives. We are doing great. 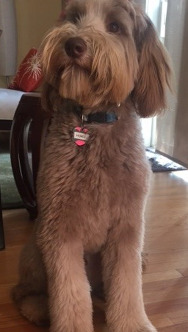 Hank is really grown up now and so smart! He is currently 51 lbs. He goes everywhere with us. 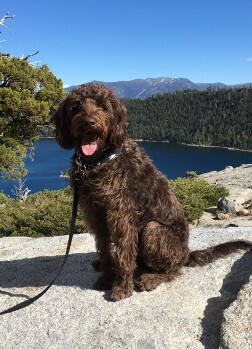 Last October we spent a week in Lake Tahoe, he loved the water and hiking with us. ( see below) Bill is currently working with Hank on sniffer training skills ( they take classes) and hopes to direct him towards search and rescue too. Kuma (formerly Giro) is doing GREAT! He’s very happy and healthy and handsome. Weight is about 52 pounds, no health problems, and he (and we) just got back from a 3000 round trip driving vacation to Seattle, in which he was voted (unanimously) the best child of the trip. Johanna regularly brushes, clips and styles him by hand, so he’s kept some of his curls and fluff. He’s great around strangers and all ages of children, and very well trained as well. On behalf of us all, thank you for a wonderful member of our family. We love him greatly! Talisker is doing great! Hard to believe she is a year old. She has leveled off at about 23-24 pounds. She is adorable, was super easy to train and is so well behaved. She has been a wonderful addition to our family. She loves to chase frisbees and to sit by the front window watching people pass by. When we play fetch with her she will often stalk the toy, creeping up on it slowly and then pouncing on it with all fours. Hilarous to watch. Luna is so wonderful. We love her to the moon and are so grateful she joined our family! She goes to work with Ryan 3-4 days a week and has other dogs there who have become her friends (she takes the metro and is a pro). She is also going to a dog daycare near our house 1-2 days a week (we just started this a couple weeks back after she finished shots) - she is a staff favorite. We also take her to the dog park a couple times a week. Between dog park and daycare she stays pretty tired on the days where there is less going on. She is generally very calm. 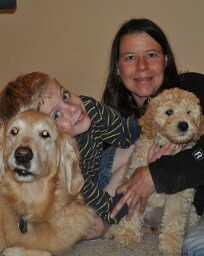 She is great with other dogs and people - including children. She's very social and likes action/being in the mix. We just finished dog training and will report back on results. We had individually been working on training and she has made progress, but is mostly just a good dog (not great at walking on the leash though, so we're working on that). Gracie is doing very well. I don't know what I would do without her. She travels back and forth from SB to Atlanta with me and is just the best. Everyone loves her and she makes people on the plane so happy. Even the flight attendants love her. Her coat is getting a little lighter but is still a golden brown. I have been taking her for training sessions and every time we go to the mall people stop us to ask about her. I am so lucky to have her. People ask about her breeder and I tell them all about you. You are the best! Thank you for my little girl. Jim loved her too. Hi Nicki! Thank you so much for your note. We are well, and we love Frankie. He is such a sweet, kind, fun, gentle boy. 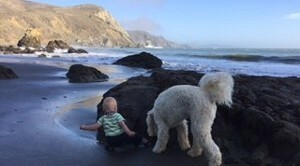 We also have a one year old boy now and he and Frankie are great pals. Hoku is such an amazing dog, and we love him to pieces! He smiles a lot, which is really adorable. 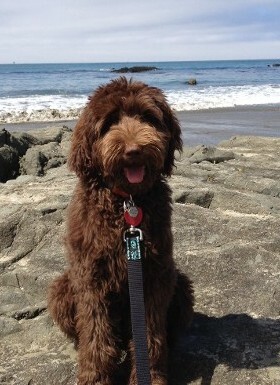 People ask us about him all the time and ask where we got him (we, of course, tell them about Premiere Labradoodles). Hoku is a total love and takes to people, including little kids, and other dogs of all shapes, ages, and sizes extremely well. Have I mentioned how ridiculously soft his fur is? It's amazing. We couldn't be happier with the newest member of our family! Thank you so much for breeding such a fantastic dog! He is truly a perfect fit for our family! 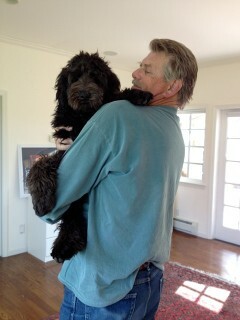 Cosmo is just a wonderful dog and a delight to have as part of our family. Everyone loves him- our family, friends and neighbors. 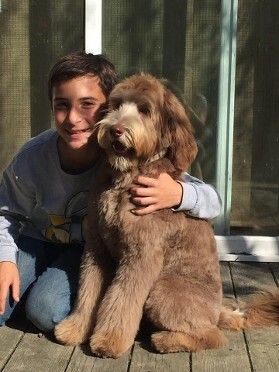 My son often goes to him and gives him a hug (not sure he likes that) and tells him how much he loves him and what a great dog he is. Jacob is not typically an affectionate kid so this is pretty cool. Cosmo has also been wonderful for my daughter, providing emotional support as well as the challenge and fun of training him. It's also been amazing to see my mom become attached to him -she was never much for animals. But, she has stayed with us for the last month and looks forward to taking him on walks everyday. 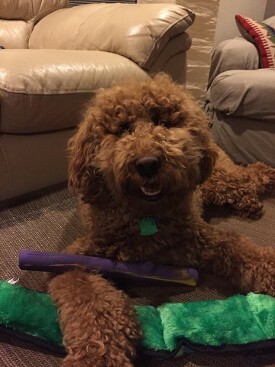 In general, he is a mellow guy but loves it when we play -throwing the ball, tug'o war or just goofing around. 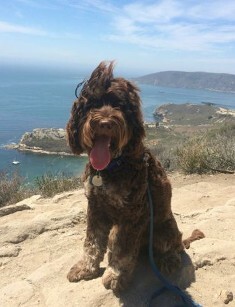 I think he is happiest when we are able to take him to a local field and let him off leash. 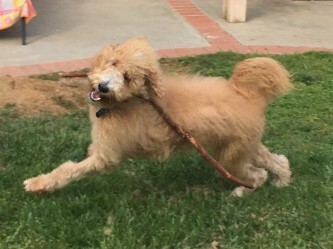 That is pure joy for him. He is amazingly fast and very ball driven. Thanks for Cosmo and Happy New Year to you and your family! She has a lovely, sweet personality, friendly to everyone, loves other dogs and cats and is careful and loving to little children. Her fur is very soft. She has a great smile all the time and her eyes sparkle. People always tell me how calm she is. She is very relaxed but when outside she prances and bounces and loves to play. Her tail curls in a perfect upright loop and makes the cutest sweep when it wags. She is so smart in training class and walks nicely on a leash. Thank you so much for matching her with me. 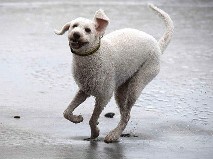 Maaji is doing really well and is currently working on training to walk with other dogs now. He has done really well with training and receives many compliments. Our dog walker/ trainer cannot believe that he's only 6 months! We recently went on a trip to San Diego. He came with us and was fantastic! Carson is doing beyond great. He is now 53 pounds of solid muscle as you can see from the photo. He begins his therapy training tomorrow and will be the youngest in the class. I attended "Parents Night" last Wednesday and from the other handlers I think he will be further along in obedience than his classmates. Hopefully he won't be too much of a puppy. Most imortantly he brings us real joy and keeps us entertained. We feel extrememly fortunate to have him. People we meet now comment on how handsome, rather than cute, and well behaved he is. We just got back from a 3 week trip with our 5th wheel and she is a great camper. We love her very much and everyone who sees her has to stop us to talk about her. Someone once said she acts like life is a party and she is the guest of honor!! So true!! 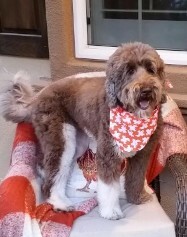 We just had Kailani groomed but didn't have any of her beautiful red hair cut off. She is so much fun and adventurous. We take her to training classes every week and she is super smart. She has such a great sense of smell. She could be a drug dog. Everywhere we go people ask where we got her so we have given your name to a few people. Most people just want to take her home!!! We have had several dogs during our lifetime and Abby is absolutely the best. Her disposition is wonderful. She is so loveable and wants to please. We love her to pieces. Thank you so much and if we decide to get another we will come back to you. 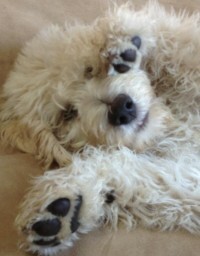 Just thought I would send you a couple of photos of Babette and compliment you on your superior puppies. We are so impressed with her calm demeanor and her quick ability to learn. You could just see the wheels turning as a command is given. She is practically 100% house broken (at 12 weeks) and crate trained. She is such a joy to have around. Her favorite activity is running fast around the lawn. He's a great dog and everyone that meets him absolutely falls in love with him. Thank you! Wanted to say thank you very much for letting us have last pick of the litter!! Bengal has turned out to be such an amazing dog in so many ways!! He has touched so many hearts. Attached are a couple pics of Molly from this past weekend. As you can see, she's very tolerant. The time goes by so quickly with her, she's always the best girl. She still loves chasing a tennis ball for as long as someone will throw, but settles down quickly. The olnly way you can tell she's not a puppy is her coat is starting to turn grey. Her coat is also getting curlier as time goes by. She jsut had a haircut in the pics, so the spirally curls are gone for now. Artie is a great great dog! So happy and lighthearted! Noodles is wonderful too, though in a different way - she is super smart and a little more serious, but is the biggest cuddler in the house! Both are about the same height, but Noodles weighs about 5 lbs less than Artie - she is about 34 lbs and is very athletic vs Artie's 39 bulkier pounds. Her fur is soft and silky and his is just like fleece - the both are very beautiful dogs and get lots of comments when we are out and about. Maggie is a wonderful family pet. She starts new classes next month to be a therapy dog. I think she will be a great comfort and joy to children or elderly who can have some joy from her. I wanted to share what happened to us this week. As I told you previously, Mike has Parkinson disease. The other day I ran an errand and when I returned (a few minutes after speaking to Mike on the phone), I saw Nola loose with her leash on! Nola was barking like crazy in the parking lot. My first reaction was, why in the world did Mike let Nola out by herself!!!???!!! As I was driving closer to Nola (trying to park) I saw that Mike had fallen and Nola was barking!! One of the neighbors said that with a/c on and the gardeners lawn mowers, she really could not hear anything in her condo; but she did notice the dog barking non-stop! When she looked out she saw that Nola was barking over Mike, and she immediately called 911. An ambulance came and Mike was brought to the hospital. He had a concussion, needed stitches in his head and had bruised ribs. He was also incoherent when he fell. Mike spent 3 days in the hospital and Nola was not the same. Mike came home today and Nola immediately napped with him and has not left his side since!!! We actually just had Nola put as a service dog as of last week. I saw improvement in Mike's walking when he walks with her - steadier and a bigger stride. So here our little girl is an "official service dog" for one week and as far as I'm concerned, she called attention to Mike's fall. She is a STAR!!! We love her and could not be happier to have her in our life!! Thank you so much for doing such an amazing job at breeding such wonderful, loving, caring....not to mention beautiful dogs!!!! Oh my goodness...I have pictures for you and planning to send a BIG thank you! We LOVE him. He is the warmest, friendliest, sweetest puppy ever. Everyone in the family loves him. 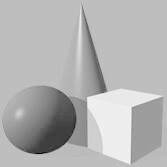 Very mellow and easy to train. Loves the kids. Perfect dog for us. Jade and I thought about you yesterday. She had a great day and weekend. She is swimming like crazy, retrieving her ball and duck decoy. Jade is so smart and loving. I make her dog food for her, sometimes ground turkey and veggies added to her puppy kibbles and sometimes ground venison. She takes her time eating and loves her pink ring that is thrown every day, sometimes twice a day. Jade will have her forever collar soon. It's going to be chocolate brown with a piece of jade set in it and a slide tag so it will not get caught on fences. She loves to go hunting and is so excited as soon as we pick up a gun to shoot. Jade has fit in perfectly with our lifestyle and sleeps in bed with me at the cabin. 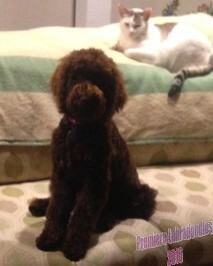 She and Bella, my cat, love to play together. And Kes, our German wire hair, has taught her so many things. Thanks so much for my beautiful little girl. 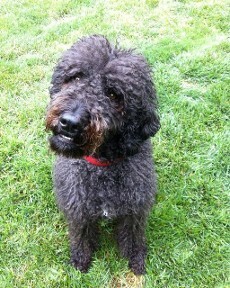 Talia is wonderful, smart, affectionate, and so much fun! I can't imagine life without her. She loves to chase a ball or toy. She prances and springs like deer instead of racing after a toy but then she will sometimes race in a circle around the yard at full speed. She loves children and is very curious about anything that moves from ants to gophers. She is beautiful and taking her out is like escorting a movie star with people asking to take her photo or pet her. She is quite agreeable. Rory turned out the most beautiful looking and sweet dog. He is our kids best friend and like a third child. Blue is a great dog and is developing a good personality. She has become very affectionate with Ken and me and is quite independent, but knows her limits and her boundaries. 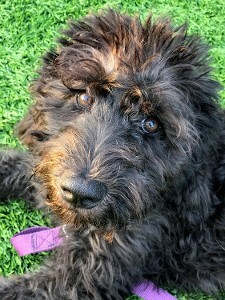 She sizes up strangers (people and dogs) before offering friendship and play, but she's willing to make friends quickly if a person or dog has good manners and likes to play tag - essential requirements in her scheme of things. Tag is even more important to her than food treats. She's a bit more patient with others now that she's a little older. I hope all the other families of Blue's siblings are having as much fun as we are with their dogs. Feel free to share my note and pics with other families, if you would like to. Ken is the Facebook person, so perhaps he can post some pics there also. Thanks for staying in touch, Nicki. Perhaps we can come visit again with Blue so you can see for yourself what a great dog she is. Great to hear from you. 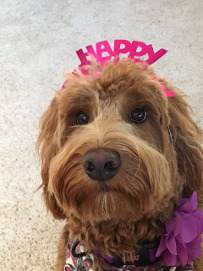 We just celebrated her birthday and she got a special birthday cookie. (See attached photos.) She is so special and a wonderful dog. She loves to swim in our pool in the summer. We will have to send you some of her swim video. She is very healthy and happy. Zoe has brought so much happiness to both of us. We love her so much. She's a real healthy pup, getting bigger by the day! My guess is shes probably 18-20lbs or so. She's so beautiful and loving, developing such an awesome personality. She's everything we could have hoped for. Thank you. This is Sophia Knight. I'm the one that adopted Lolli from one of your clients. 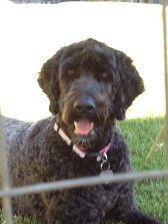 Lolli is doing great - not sure if you remember that she is now Walley. 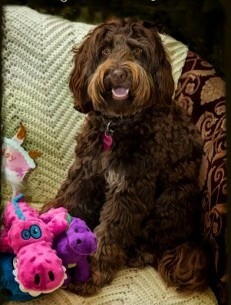 She is a service dog in New Jersey and is doing fantastic. 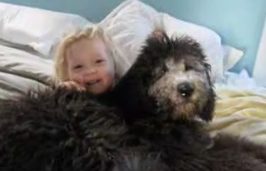 She has been alerting to her recipients seizures and has become a very important member to this family. Henley is a great boy! He is so friendly and gentle with everyone he meets--kids, dogs, adults--he loves them all. We've taken him camping (big hit), an outdoor movie ( he made friends with a 120 LB French Mastiff named Rosie), and 2 weeks ago we did a 5k run (he pulled me down half the course:). Everyone loves him and comments on how handsome he is. 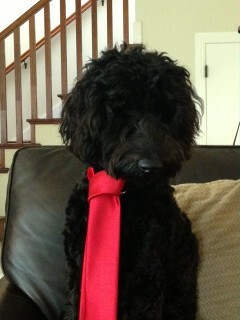 He goes to doggy day care a few days a week and also has a "girlfriend" named Cooper who he plays with a fair bunch. They're cute to watch since they are about the same age and possess a lot of the same puppy-ness! We just love him to pieces and I think so much of his sweet personality is due to his stellar beginnings at your house, so thank you! I love ogling the new Premiere puppies on your website but so far haven't convinced Andy about a number 2. Hope you and the family are well! We just had another baby boy a few weeks ago and Bailey has been incredibly gentle and protective of him. 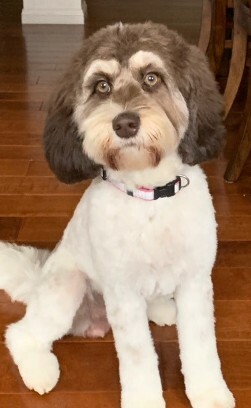 We had his hair fairly long this winter (maybe a little too long), but had to cut him really short a month ago since he was getting too matted. I think we learned how far we can push it and will brush him religiously from now on! He's a central part of our family though and we're constantly amazed at how perceptive he is about his environment. 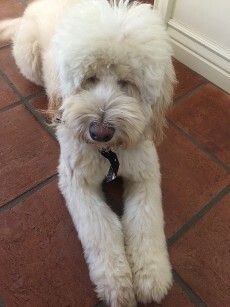 I can talk to Bailey like a child and he understands a lot of what I say, will come from long distances when he's not on a leash, and has our routines down to the minute. 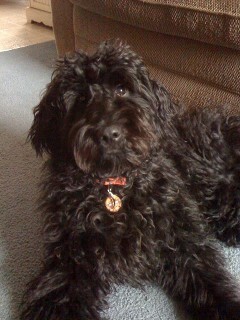 Thank you for giving us such a fun member of the family, my best friend and our companion for our children's lives! 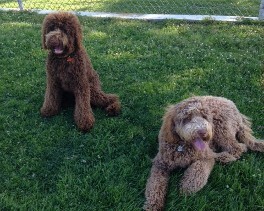 Dude and Charlie had another play date thought I'd share some photos. It's so funny how similar they are. We are going to try and meet up more regularly! Thanks for such great dogs! 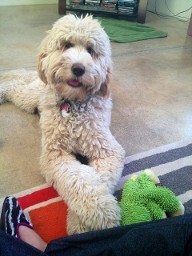 My beautiful pup's growing up. He's an absolute joy! 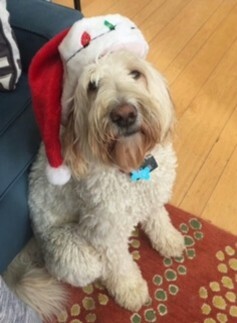 Hope all is well with you and yours. Have a terrific weekend. Hi Nicki! The new litter looks so cute! It feels weird not to be taking one home, lol. Arthur and Noodles took rattlesnake aversion training yesterday and did extremely well - no shock collar, just a spray collar with compressed air. 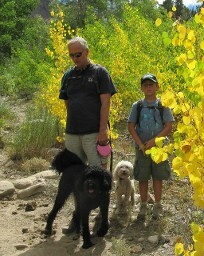 They both learned really quickly and now do anything to keep away from the sight, sound or smell of a rattlesnake. The trainers said they are the calmest doodles they've seen and were in love with how shiny Noodles is. Noodles starts training in two weeks, Arthur just finished intermediate obedience and started in agility. They both are so easy to teach! She is 18.8 lbs at 4 months and starting to get tall. Here is a photo of the two of them together. He is weighing in at 74 pounds of pure love now and is healthy as an ox! We should be considering getting another one at some point. Any advice as far as how long we should wait? 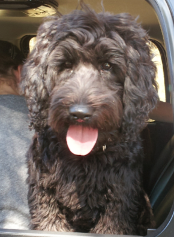 Don't want Cooper to be too old to enjoy a puppy, however, what we would want is probably another standard size Doodle and looks like you are breeding mainly smaller ones. Let us know. 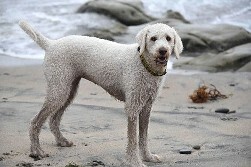 Thanks for the email and inquiring about our Rory boy. He's doing amazing!! 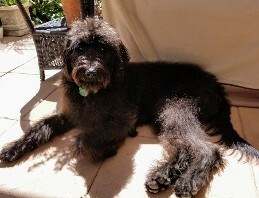 We have fallen in love with his well behaved, loving, easy temperament and he has become part of the family! He brings such joy to our twins and plays non stop with them in a very gentle fun- loving way. He's gotten to be pretty big but still thinks he's a lap dog. He's healthy and loves his walks, playing with our neighbors dog and sticking his head out the sunroof while we're driving (it's quite funny :)) thank you for all your hard work in the beginning and starting him off with a good foundation. 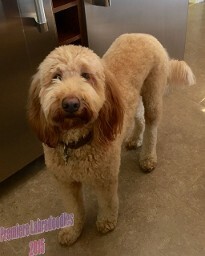 He's a beautiful, sweet dog... We love our "Rory-boy"!! Saba is doing GREAT! Everyone who meets her absolutely loves her. She is such a joy to have around ~ very much a people person and doesn’t like to be alone. Definitely a very loving, patient, playful, attentive dog. Her favorite thing is to play catch ~ preferably while swimming in our pool. She loves to go for car rides and licks the window until we open it for her :) Occasionally she will still look up at me through her eyelashes with her head down, but she isn’t as submissive as I thought she would be. She weighs 58 pounds and is very healthy. Her coat is soft like a cotton ball. 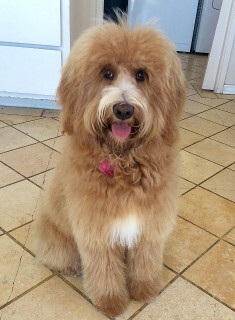 She is super fluffy after being groomed, and if I don’t comb her after swimming her coat is loose curls. The coat doesn’t matt badly, but we do comb her once a week. When the time comes, we will definitely come to you for another dog. Sounds like you're all very busy! Camper is doing very well. He's active, loves to play, and is so well behaved. He is a very well-loved dog. My husband usually works from home, but on the days he has to work at the office or days we're away at softball games/tournaments, Camper has a second family next door that he stays with. He's rarely left alone. He's a bit spoiled in that regard. His step-family lets him sleep on the bed, so he really gets the royal treatment there. 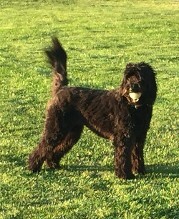 He loves playing ball, hide-and-seek, and chase. 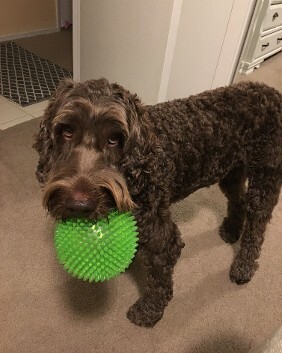 He's not the most coordinated ball catcher, but he's getting better. While the kids play out front, he's content to be out there with them and never runs away. He's a great dog all around. Thanks for checking in. Glad to hear you're all doing well. He weighed about 18 lbs at 16 weeks, the vet said he should be about 2x that when he is full grown. His lower fangs are loose and should be falling out this week. In other words, he has been growing like a weed and looks beautiful! Everyone asks where I got him! He has become a huge part of my family's life and is an absolute love! So smart and cuddly. I just thought I'd shoot you a quick email with updates on Pete. He is still as adorable as ever. He learns new tricks so quickly and easily and really is just the happiest puppy. He's about 19 inches tall now and right around 30 pounds. I was checking out your website and your new puppies are so adorable! If only my husband would let me get another. I hope all is well with you. Here's a picture of Pete. Take care! Roxy is so cute and sweet. My daughters really appreciate all of what Tia did b/c she is really cuddly. She is already great on the leash for walks and is meeting other dogs. She is a little shy but loves people and kids. She is doing great in the kennel at night and does bark when needing to go out and then goes right back in and is quiet. Girls have a great game with her that they thought up called "Roxy tag" (she is conveniently always it)! I am the worst at sending pictures but she is getting bigger and everyone stops us and says "what a cute puppy". Thank you again- we cannot be happier. 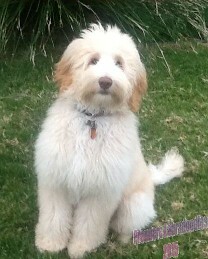 "Here I am, almost six months old and newly groomed. 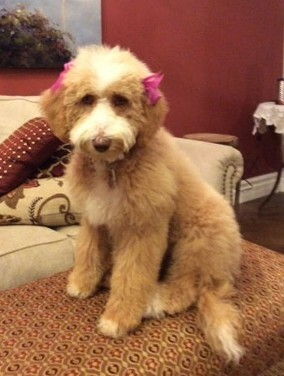 Mom likes the longer teddy bear look. Thank you so much for providing our family with Wally. An absolute love, he has provided so much joy to our lives. We look forward to staying in close contact with you in the years to come. 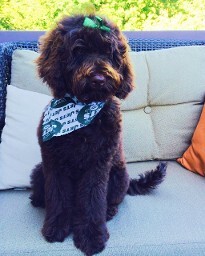 "Tillie has been the perfect addition to our family. Everyone that meets her comments on how calm and friendly she is as she walks up to them and sits at their feet. Originally I thought getting a puppy would mean a lot of cleaning, sleepless nights and chewed shoes however I am amazed how calm and intelligent Tillie is. She always sleeps throughout the night, is toilet trained and quickly picks up tricks. I don't know what you guys are doing over there to your dogs but I wouldn't change a thing!" I got your message yesterday. Great to hear from you and it's nice to know you are interested in how things are working out with Kingston. Let's see where should I begin? Kingston is such a wonderful pup! We can't believe how fast he is growing. 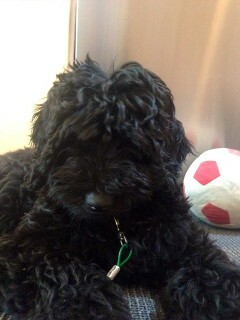 We have a great veterinarian who always asks if he could trade his puppy for Kingston. 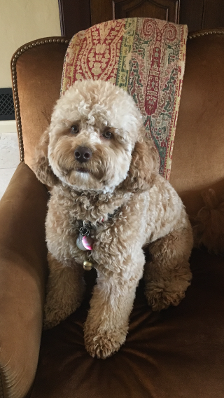 He always jokes "let me see if he has a heart beat because he looks like a stuffed animal and way too mellow for a puppy!" 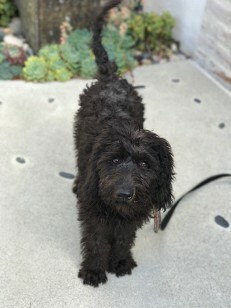 We prepared for a really energetic and naughty puppy as others have warned us that the Labradoodles they have met have all been pretty rambunctious. 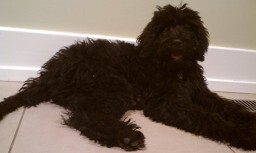 Kingston is playful and smart and is learning commands rather easily. He was completely potty trained by the 11th to 12th week - going to the sliding door giving us the signal to let him out. He took to his crate the first night we brought him home with very little whining. Week after week we prepared for the "crazy puppy phase" but we feel that if he continues as is- we got pretty darn lucky! He tries to chew on socks and tries to get into the trash bin if it's accessible but once told no- he walks away. 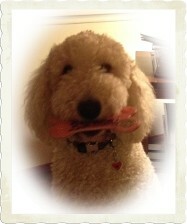 Like a toddler we just have to keep an eye on him as he loves to put stray items into his mouth. 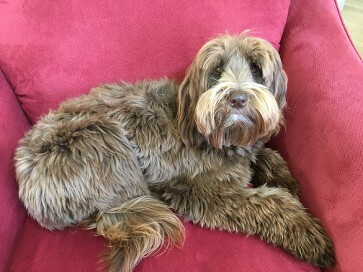 But for the most part he just enjoys his place among the family- often laying in the comfort of his bed in the family room or just sitting right beside one of us. When he can, he tries to creep onto the kids' bed or our bed and tries to snuggle up for a nap. 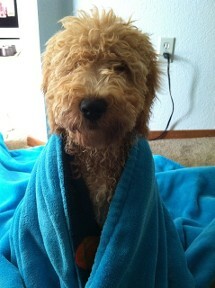 He is great with bathing and brushing. It's hard not to think about adopting another one from you guys to join our family! 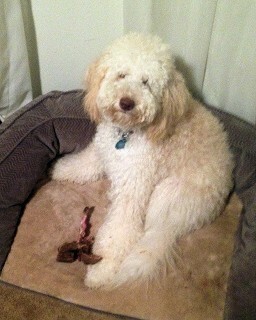 He has his "brother", my parent’s maltipoo, who he is now 3x bigger than. They play with each other at least 4-5 times a week. But I can't help to think if one is great, two will be better! He is the star whenever we take him for a walk in our neighborhood or at our outdoor mall. We are constantly stopped and asked what breed he is. In fact I’ve had to provide your website info to so many people I thought about recommending you give your adoptive families business cards to pass out when we bring our puppies home. During his first few weeks with us - people could not believe his temperament for a 10 week old puppy and his face then and now can melt anyone’s heart! He is a beautiful pup inside and out! He is a wonderful addition to our family and brings us all joy! 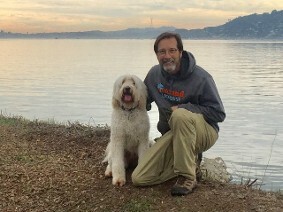 "Camper, our 8 1/2 month old Labradoodle, is a beloved member of our family. He is wonderful with all children and our 3 and 7-year old daughters adore him. He loves to play, but is careful about moving too quickly when children are around. He loves to cuddle and seeks out attention whenever he can. Camper is a fast learner as well. He lets us know when he needs to go outside and waits to have his paws dried when he comes back inside. 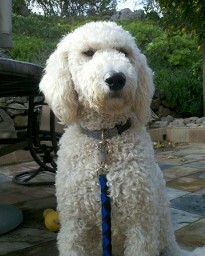 Camper loves walks, camping trips, playdates with other canine friends, and playing in the backyard with the kids. 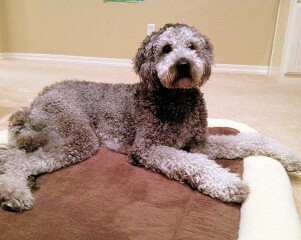 We love that he is hypo-allergenic and doesn't have that yucky "dog" smell. We love our good boy. 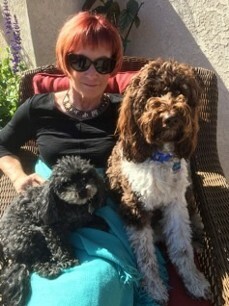 "- Lisa M.
I am really enjoying my puppy, Lucy (Arrow). She is so much fun to play with and easy to train. Lucy's coat is so easy to care for since she doesn't shed! On walks, I am often stopped and asked which breed Lucy is. 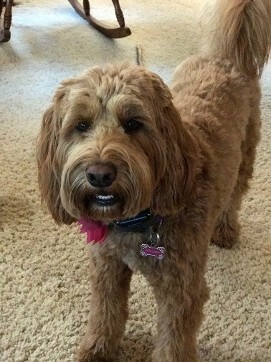 She is a great looking dog with a striking appearance! Thank you so much for breeding such a great dog. I wouldn't hesitate to purchase a second puppy from you. 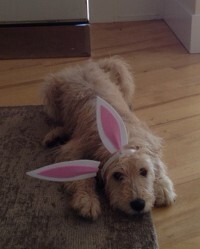 Basil is a great dog, and he' s brought a lot of joy and laughter into our lives. John and I constantly remark to each other how lucky we were to have found him. Everyone who sees him gushes over how cute he is; he has the prettiest dark eyes and the longest blond eyelashes ever! But the best part is his temperament. He is amazingly calm and well behaved, and not the least bit destructive. He has learned to ring a bell to go out, and walks on a leash better than any dog we've ever had. 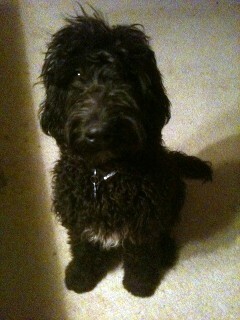 He's so smart- one of his nicknames is "Einstein" because he catches on to training so fast. 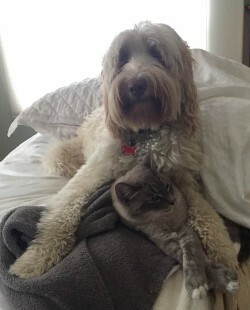 He has bonded really well with our female Labradoodle, Cholula. They play together enthusiastically, and happily share food bowls, toys, and beds. It's a constant source of amusement to watch their interactions; one of his tricks is to bite onto her tail as she tries to run away from him! Plus, he's super cuddly, and can't seem to get enough petting, which works out great, because we can't stop petting him- he's so adorable. All in all, he's turned out to be the perfect dog for us. 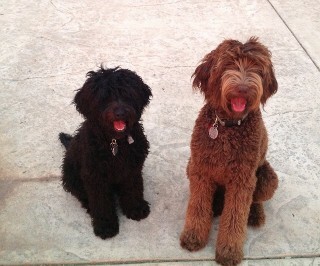 I would just like to say that your labradoodles are awesome dogs. 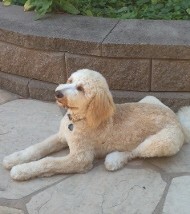 Scout has become such a great addition to our family with the most amazing temperament I have ever seen. 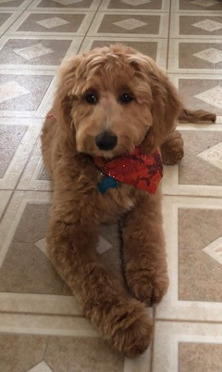 Scout is now 5 and a half months old and we have still not experienced "the puppy stage." He is so well mannered and well behaved it is amazing. He loves everyone and thinks everyone should LOVE him! Nobody is a stranger to him. 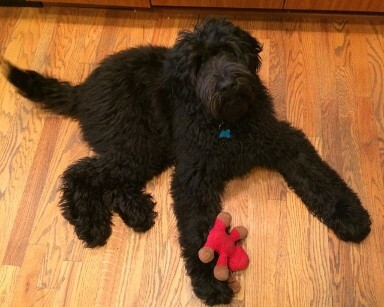 He is such a great mix of Labrador and Poodle. The parents must be amazing to breed such great pups. 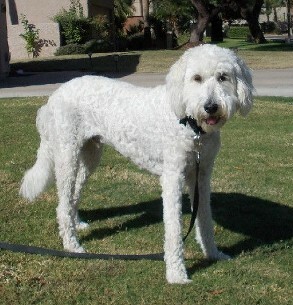 Just enough poodle but still the labrador temperament. His non shed coat is a huge plus and his care is so easy. 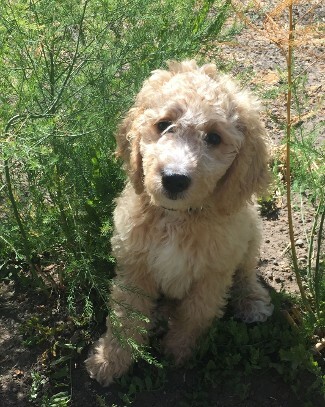 I made the best decision to purchase my Labradoodle from you. I loved that you had a family home and the puppies were a part of your family from the very start. I could tell you loved each and every one of them. I looked for a puppy in alot of places and nobody compared to your puppies. I also appreciate all of the help with any questions I have had even after the purchase of Scout. You have become a family friend. Again, thank you so much for the opportunity to own one of your pups. 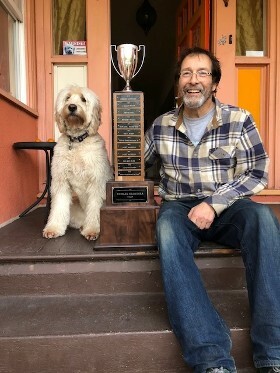 Scout and I thank you from the bottom of our hearts. Here is a picture of Rory. Rory's doing great and as healthy as could be, we love him so much. 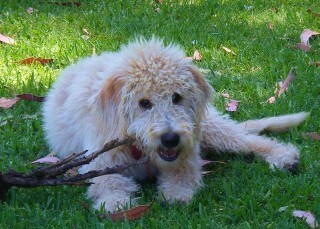 In fact he turned out to be the picture perfect Labradoodle and exactly what we envisioned him to look like. The kids keep him busy and as you imagine Rory keeps them busy. :-) He's a great dog and although he's a little stubborn he makes us laugh all the time, and it's definitely one of his fun personality traits. Hope things are well with your new liter. Will send more in a few months. Thanks for checking up on us. Sandy is doing great. She's turned out to be a gift to the whole family. Whenever we're home, she hangs out with Tyree, Jasper, and I. She's a love and just wants to be with us. In the mornings she plays with Jasper, in the evenings she fraps (frenetic random actitivty pattern) with Tyree, and I play and hang out with her periodically during the day. When we're at work, she hangs out with Grandpa (Tyree's dad) and Lucas (his retired seeing eye dog) for a while. After about a week, Lucas warmed up to Sandy. Now they play for long stretches then nap together. It's very cute when we come home and she's on Grandpa's side of the yard. Both dogs trot over together to greet us. The backyard has dog toys everywhere that they play with, you wouldn't even know we had a child! Bailey is doing great. 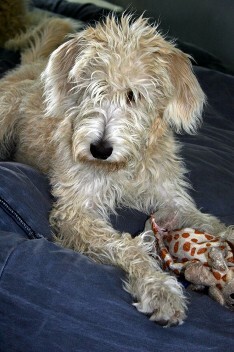 She is such a fun dog and has a great temperament. We take her everywhere, including to work because she does not bark (Neel's workplace allows well behaved dogs). And we did not even have to spend too much time training her! 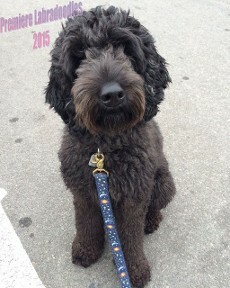 We made a great choice with the labradoodle breed! No health issues so far but she does have a sensitive stomach so we have to be very careful what we feed her. Loki is such a great dog. Everybody loves her and always asks where I got her. And yes, she's still smart as ever. She recently discovered she can reach the table and countertops so we had a couple days of shooing her off that, but she learns quickly. She is super friendly yet becoming a good watchdog. She has a booming bark for her size and surprises people. If she barks in the car, your ears will ring for a few minutes. lol We love that because she scares the deer. I think she would just lick an intruder though. Ava is great. 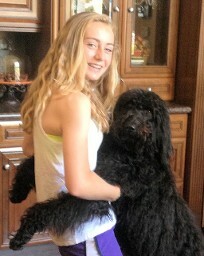 She hardly seems like a puppy anymore; she's got tall legs and her hair is growing like mad. In fact it looks as if her hair was dyed: her roots are now ginger on much of her body. I don't think we know yet what she'll look like! She's been pretty good. Dare I say she's pretty much house trained? Now that she's bigger she likes to check out food on tables but she pulls back quickly when she hears no. I think she's checking to see if the rules have changed in the last five minutes. I will send a photo from my phone. She is a darling and we are still completely in love with her. In fact, I can't remember life without her! Cosmo is doing great! He had his final shots and is now 16 lbs. We are all speculating on what is final weight will be. The vet says close to 40 lbs. 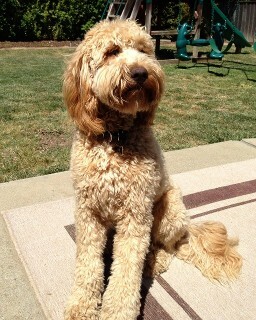 He is sturdy but does have beautiful long legs and the most incredible paws. 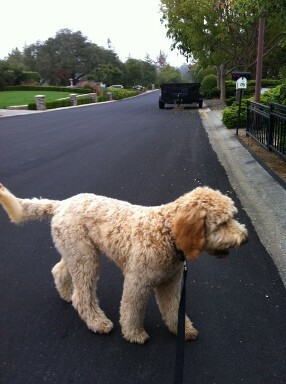 He is like a little celebrity when we take him on walks -- people just love him. 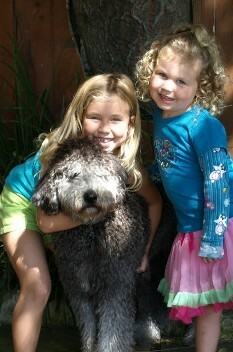 We went to downtown Los Altos recently and were stopped constantly by people wanting to meet him. Our family loves him and he brings a smile to everyone's face. Jacob, our 11 year old, grows more and more attached to him. It's wonderful to see him feeling more and more responsible for Cosmo - this is probably because they love to play with each other. Oh, and he is soooo soft. That is the first thing people notice when they pet him. Cosmo is pretty much potty trained and is good at letting us know when he needs to go outside.He is a thirsty guy. We don't limit water intake (like some experts advise) because he has always been able to "hold it". From the start he seemed to be able to go 8-9 hours at night without making a potty trip to the back yard.